The amazing thing about track & field is that with so many meets taking place simultaneously around the nation and with each of those meets having upwards of 40 unique events, the unexpected can happen literally anywhere at any time. No one knows where or when the next great moments are going to happen, so keep those smartphones and video cameras rolling. Cast your vote for the weekend’s best moment at the bottom of the page. Friday Evening: Sandi Morris of Arkansas cleared 15-1½ (4.61m) on her third and final attempt at the Texas vs. Arkansas dual to surpass the previous collegiate record by just one centimeter – a record formerly held by her opponent Kaitlin Petrillose of Texas. 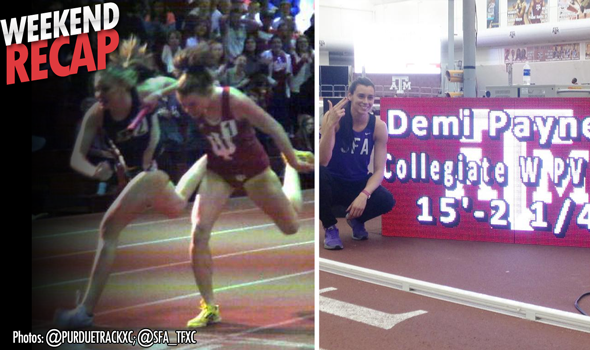 Saturday Afternoon: Demi Payne of Stephen F. Austin – daughter of all-time great men’s collegiate pole vaulter Bill Payne, and herself a mother of just over a year to a young boy – cleared a new record height of 15-2¼ (4.63m) on her very first try at the Texas A&M Aggie Team Invitational. She took three more unsuccessful attempts at 15-3 (4.65m). When the dust cleared, those two women ended the weekend as the only two collegians above 14 feet on the young season, and at Nos. 8 and 10 (tied) on the all-time U.S. indoor performers list . How significant was this weekend historically? With all three of those 15-foot vaulters still active, and the official collegiate men’s record under constant threat from Akron’s Shawn Barber, we have just begun the Year of the Vault. The PSA we posted at the beginning of this article used last season’s historic women’s 4×400 relay between Oregon and Texas that clinched Oregon’s fifth team title in a row with a photo-finish win. Though the stakes weren’t as high in Bloomington, Indiana, on Saturday in a dual between in-state rivals Purdue and Indiana, the situation was much the same: win the meet-finale 4×800 relay and you win the meet. "Kiara McIntosh led off the 4x800m and gave the Boilermakers a slim lead through the first leg of the deciding race. She handed the stick to Vanessa McLeod who ran a strong leg and gave the Boilermakers a 15 to 20 meter lead, before handing off to Katie Hoevet. Hoevet, who had earlier finished second in the mile behind [Indiana’s Brittany] Neeley, kept the Boilermakers within a step of the Hoosiers before handing the baton to [Hope] Schmelzle. "Schmelzle stayed in about the same spot through the first 700 meters, about a step behind Neeley. Then came the big finish. Schmelzle, who Neeley had beaten in the mile by 2.24 seconds earlier in the day, found her kick and caught up at the line as both threw themselves across. From there, both Schmelzle and Neeley were down on the track as the all eyes turned to the scoreboard. The crowd waited 34 seconds before the scoreboard showed Purdue’s winning time of 8:57.19. It was another couple of minutes before Indiana’s identical runner-up time was posted on the scoreboard, but the official result was that Purdue’s time was 0.001 of a second faster." The two schools combined to run the third- and fourth-fastest times of the young collegiate season, though the event is not one that is contested at the NCAA Championships. Need more evidence of how close it was? Oregon teammates Jenna Prandini and Laura Roesler may have made the biggest headlines for the Ducks last year during the outdoor season, and the aforementioned 4×400 relay may have took the cake indoors; but under the radar was frosh Jasmine Todd‘s dual All-American finish in her NCAA Championships debut with a third-place showing at 60 meters and a sixth-place effort in the long jump. Just one meet into her 2015 campaign, she’s back and better than ever at 60 meters. After running a 7.29 in the prelims at the Washington Indoor Preview on Saturday, she blasted a collegiate-leading 7.15 to edge out USC frosh Ky Westbrook by just .03 of a second. The time tied her for No. 10 on the all-time collegiate list, and – so far as we can tell – her performance was the fastest-ever by a collegian in the month of January. Texas’ Carlette Guidry missed that distinction by just one day in 1991, running 7.14 on February 1. Readers with Flotrack Pro Subscriptions can find the replay of her blazing finals performance here. Hours earlier on the opposite side of the country, defending national indoor 200 meters champion Dezerea Bryant of Kentucky had what had then been a collegiate-leading 7.18 at the Kentucky Invitational. Todd and Bryant could be heading for a showdown this weekend as Oregon is among a slew of nationally ranked teams travelling to Kentucky for the Rod McCravy Memorial Invitational. Who else could run the 60 at that meet? All-college No. 4 Prandini, No. 5 Morolake Akinosun of Texas, No. 6 Mikiah Brisco of LSU, No. 8 Javianne Oliver of Kentucky, No. 11 Aleia Hobbs of LSU and No. 11 Jada Martin of LSU. Stay tuned for that one. [Worth noting: Westbrook, Brisco and Hobbs are all freshmen]. Bryant didn’t walk away from the meet empty-handed, however. She notched the fastest collegiate 200-meter time of the year with a 23.12 on Kentucky’s oversized track. We touted this weekend as belonging to the future of men’s sprinting as all four members of the IAAF World Junior Championships gold-medal winning 4×100 relay were slated to compete. In the end, only defending NCAA 100-meters champion Trayvon Bromell of Baylor and Florida State’s Trentavis Friday took to the track, and neither of them left with the weekend’s fastest time in the country. (Ole Miss’ Jalen Miller [who had been the collegiate leader at 60 meters entering the weekend] and Florida State frosh Kendal Williams were both scheduled in the 60 at Auburn, but neither competed. Miller also didn’t compete as scheduled at 200 meters). Bromell won the 60 meters at Texas A&M Aggie Team Invitational on Saturday in 6.61 after running 6.58 in the prelims, but he was upstaged on this weekend by a potential Big 12 rival in Oklahoma State’s John Teeters. The Cowboy dropped a collegiate-leading 6.54 Friday afternoon at the Nebraska Holiday Inn Invitational. The performance put him just .02 shy of the collegiate all-time top 10. Bromell also tried his hand at 200 meters (not a typical event for him) and finished third in 20.80, which also stands as the third-fastest time in the country this year. Texas A&M’s Shavez Hart took the win and the collegiate lead in 20.76, while A&M’s Bralon Taplin edged Bromell out by thousandths of a second in a separate heat. Trentavis Friday, meanwhile, made his own debut at 200 meters in 20.86 for the fourth-fastest time in the country. He bested last year’s fourth-place outdoors 200m finisher Aaron Ernest of LSU by nearly .4 of a second. The future of Stanford track & field was on clear display at Washington, as the Cardinal had three particularly impressive track debuts in three different events. Perhaps the most impressive was Elise Cranny, who finished fourth at 1000 meters close behind the Nike Oregon Project trio of Shannon Rowbury, Jordan Hasay and Treniere Moser in 2:42.39. The time put Cranny at No. 7 on the list of all-time, all-conditions collegiate performances in the event (Washington’s track is oversized). The only one of the three to debut with a win was Olivia Baker. The New Jersey frosh used her dual 400-meter and 800-meter skills in a 600-meter race to outkick Oregon frosh Raevyn Rogers and Nike Oregon Project teen phenom Mary Cain to the line in a collegiate-leading 1:29.42. Though we’ve seen Sean McGorty for a couple of cross country seasons, we hadn’t seen him on the track in a Stanford uniform until Saturday. He made the most of his debut, finishing third in the mile behind the Nike Oregon Project duo of Matt Centrowitz and 2012 The Bowerman winner Cam Levins and becoming the first sub-four collegiate miler of 2015 in 3:59.34. Flotrack Pro Subscribers can watch the Cranny, Baker and McGorty race replays. The football/track & field dual-sport setup is a fairly common one [we’ll soon publish our week-by-week list of the top football players in college track by event], but the basketball/track & field double is far less common. Marquette high jumper Wally Ellenson is a prime example of how it can work, though. When last we saw Ellenson, he was wearing a Minnesota uniform and leaping to an NCAA Outdoors runner-up finish in the high jump. The 6-6 guard – who cites basketball as his main sport – transferred to Marquette (in his home state of Wisconsin) this past year, and is currently sitting out the basketball season by NCAA rule. That opens up much more time for him to compete on the indoor track circuit, at least this year. He made the most of his Marquette debut – just his third indoor track meet in three years – with a collegiate-leading and career-best leap of 7-5¾ (2.28m) on his first attempt at the Wisconsin Open. He missed his three attempts at 7-7 (2.31m). While Ellenson was jumping high, Jarvis Gotch of Louisiana Tech was jumping far. Competing at Texas A&M on Friday, Gotch soared for an indoor career-best of 26-2¾ (7.99m). No stranger to huge jumps – he nearly jumped 27 feet outdoors while at South Plains and notched a similar indoor jump two years ago – this mark puts him in elite company. Only two men in 2014 jumped farther throughout the entire indoor season, and only two more did in 2013.